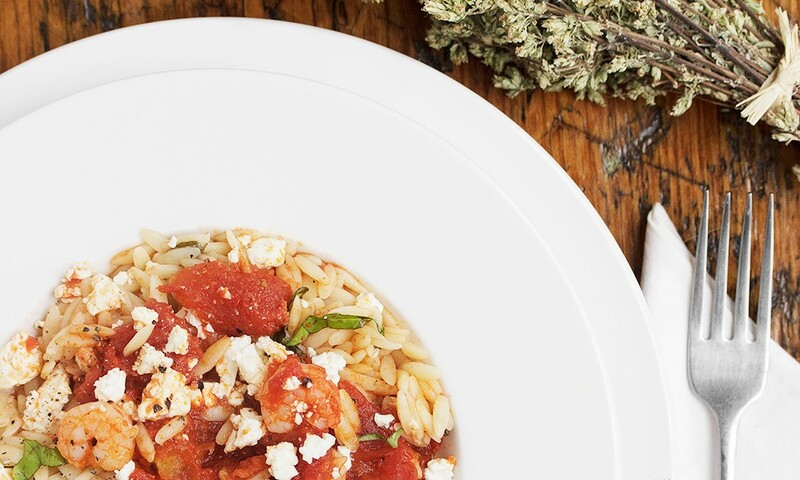 I have always loved orzo, but honestly, I don’t have a long list of ways to serve it up. 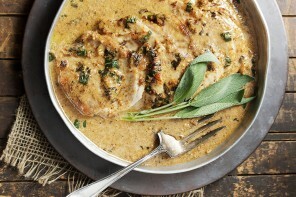 Typically, it’s with some garlic and Parmesan – maybe some lemon – and usually as a side dish. I guess that’s why I was so excited when I discovered this recipe. It’s packed with flavour, it’s a “main” and it’s ready in a flash, which always makes me happy. A fresh and different way to enjoy orzo, as well as a quick and easy weeknight meal! Use your best canned tomatoes for this one, as they really shine in this dish. As for the shrimp, small or large, as you like. Just be sure not to cook them completely when you saute them (just cook until pink), so they aren’t over-cooked after the trip to the oven. You can control the amount of heat (or not) by increasing or decreasing the amount of red pepper flakes. I’d suggest a few, even if you aren’t a spice-lover, as they add great flavour. Be sure to taste and season well with salt and pepper, but remember that feta is very salty, so it will add some salt to the dish all on it’s own. This is almost a one-pot meal. I do everything from cooking the orzo, to sauteing the shrimp, to making the tomato sauce in one large saucepan, not even bothering to wash it in between. I transfer everything to my 8-inch cast-iron skillet for the oven, as it makes it nice for serving right from the skillet. For a gluten-free option, replace the orzo with arborio or carnaroli rice. This is a great way to enjoy orzo pasta and is quick enough for a weeknight meal. This is one of those dishes that benefits from having all the ingredients prepped and ready ahead. 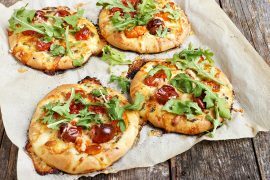 Preheat oven to 400° F. Brush an 11×7-inch glass baking dish or an 8-inch cast-iron skillet or baking dish with oil. Cook the orzo according to package directions to al dente. Drain well and return orzo to same pot you used to cook it in. Add 1 Tbsp. olive oil, 1/4 cup of the feta cheese, the Parmesan cheese, and 2 Tbsp. of the fresh chopped basil. Stir to blend. Transfer orzo mixture to your prepared dish. In the same saucepan, heat 1 Tbsp, oil over medium-high heat. Add the shrimp and sauté just until slightly pink, about 2 minutes (shrimp will not be cooked through at this point, but will finish in the oven). Scatter shrimp on top of the orzo. Add remaining 1 Tbsp. oil to same saucepan. Add garlic and sauté over medium-high heat for about 30 seconds. Add tomatoes with juice. Break up the whole tomatoes with your hand or a masher and cook for 1 minute. Stir in wine, oregano, crushed red pepper and remaining 1/4 cup basil. Simmer uncovered until reduced to thick sauce consistency, stirring occasionally, about 5 minutes. Taste and season sauce to taste with salt and pepper. Spoon tomato sauce over shrimp. (*If you baking dish is really full, consider placing a baking sheet underneath it to catch any bubble-ups). Bake in pre-heated 400 ° F. oven for 15 minutes. 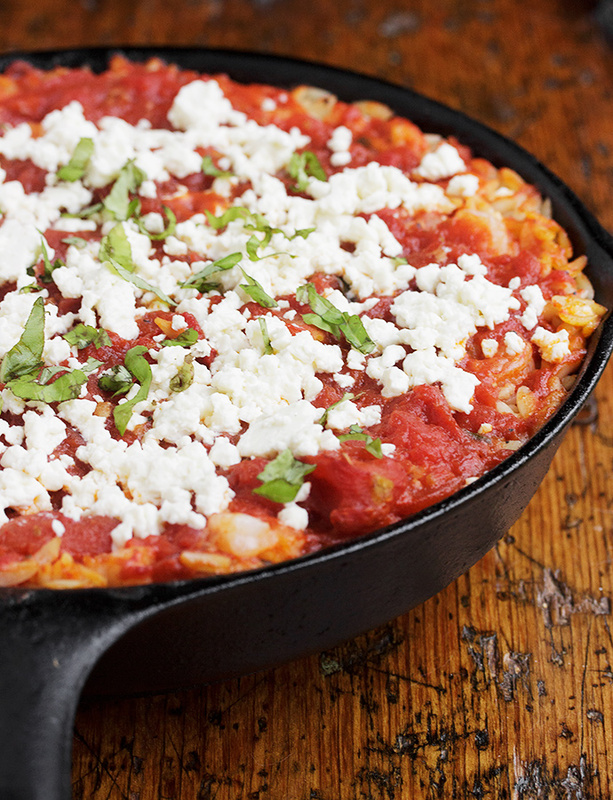 Sprinkle with remaining 3/4 cup feta cheese, return to the oven for another 5 minutes. Garnish with a bit more basil, if you like and serve. Thanks so much, Ami. It was! What a lovely meal, all of my favorites! Thanks Cheri. We really enjoy this dish! 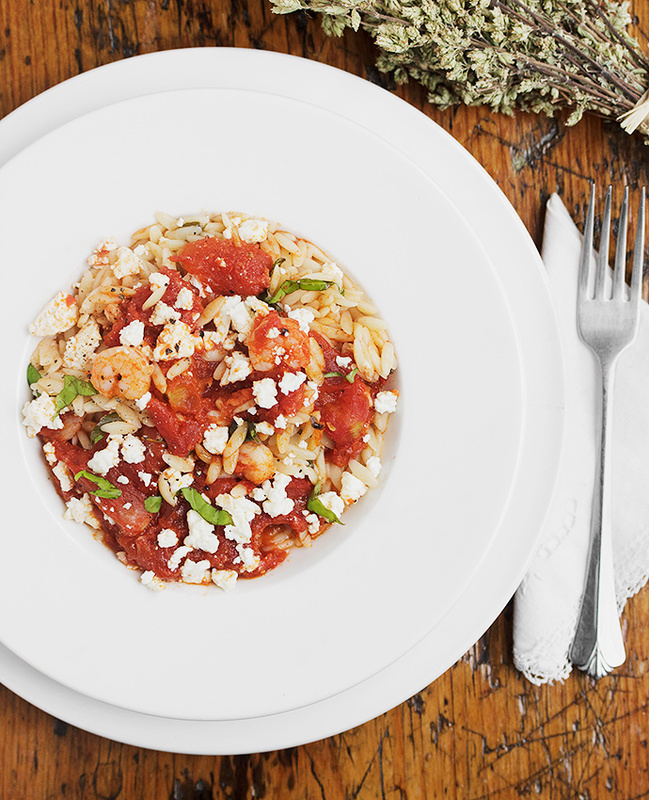 I love orzo (and shrimp!). 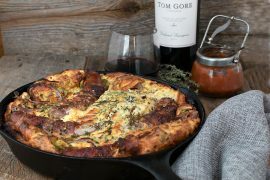 What a great weeknight meal option, I love the idea of serving it right from the skillet! Such gorgeous photography and this looks delicious! Thanks so much, Millie. We all enjoyed this dish here.